Unfortunately 1ac was a 9-letter unclued entry, so no immediate help there. I was pleasantly surprised by getting the first four down entries in double-quick time, and 1ac was •IN•M•N••. This led me to check with Chambers under binominal, and see it defined as “making use of two names, as the Linnaean nomenclature”. This was confirmed by the start of the preamble which said that 1 was “identified by two names”. Moreover, it was associated with name A, and it therefore followed that the entry at Adn was LINNAEUS. Ten minutes in and I was on a roll. We were told that removing one name left a term associated with name B and so one N needed to be removed and I looked up binomial with its definition of “consisting of two terms as a + b (maths); another term for binominal“. A bit further down, and there was binomial theorem, “Newton’s theorem giving any power of a binomial”. All this binomial/binominal was doing my head in! 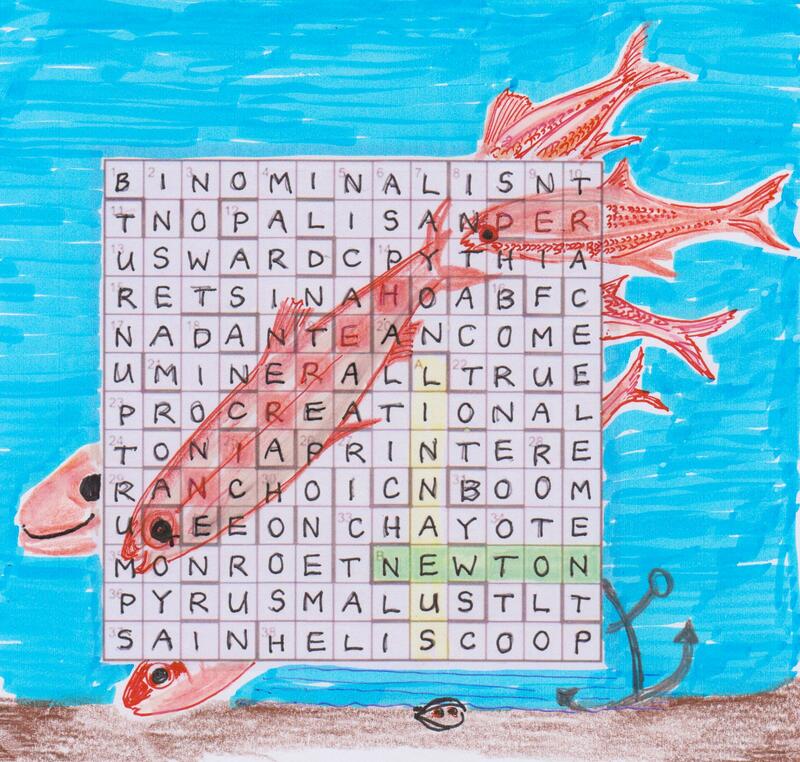 Anyway, Newton was obviously name B, and the south-east corner was begun. However, for most of the time, I found myself working down from the north-west corner in a fairly straightforward manner. We have recently understood how the editors have solved the crisis of the omission of Some first names in the latest Chambers: this week we had “18, 24 and 36 can be found in earlier editions”. A little grin would have crossed the faces of some solvers when they found that 36 was PYRUS MALUS. It wasn’t a first name, but the Lynnaean name for the apple-tree, and found under that entry; it bizarrely disappeared from the tenth edition (2003), having been in many editions (perhaps even all) prior to that. And so, the grid was completed in under two hours. I must say that I thought the clues were excellent, with enjoyable surface readings to boot. My problem at this point was that the correct letters that I had for misprints read Clupea Ruag. Clupea was the name for HERRING and that could be found running diagonally in a NE-SW direction, and RED was reversed in row 2, confirming the “spurious and misleading example”. But how did ‘ruag’ relate to RED. It took some time to realise that the G was what the preamble referred to as “a constant concern for B”, and stood for the gravitational constant that Newton had fun with under the apple tree. However, that still left Rua, and try as I might, I couldn’t find any alternative. Surely the correct letters of the misprints were ‘roof’ for ‘hoof’, ‘punching’ for ‘pinching’ and ‘woman for ‘women’. Moreover, there were two REDs: one in row 2 and another somewhat skewed in rows 4 and 5. And there was even RUA sitting above the tail of the HERRING. Without understanding the meaning of rua, I was stuck, and so I remained. In the end, I highlighted in red the HERRING and the RED in row 2, not really happy, especially since practically everything I own was about to disappear into boxes for the second house move in six months. I sincerely hope that it will be the last for at least ten years. Putting my confusion to one side, this was an excellent puzzle from Verbascum, I think! I look forward to the solution to see where my mistake lay and to find out what Clupea Rua really is! One thing you could always be sure of finding in a Numpty blog has, for the last two years, been at least one stinky red herring. We are very good at pursuing a false trail. BRB has just taught me that the red herring is connected with drawing a herring across the track to put the dogs off the scent. We very easily lose the scent. Listener setters have been rather clever at producing red herrings. I have only to go back to Gos’s Murder Mystery of last August, where he had us almost misled into highlighting Dr Fell, rather than HM, and Dysart led us a fine dance hunting for Kafka works rather than those of Haruki Murakami, last April. We started our solve rather dubiously, as the preamble seemed complicated. Clearly solutions needed to be entered to lead us towards those two names. However, we were lucky again and within minutes had our TRACE ELEMENT (with a bit of Numpty discussion about whether they can be found in wood – Chambers finally convinced us that this was one of the misprints – WOOD for FOOD), TURN UP TRUMPS, PROCREATIONAL, PALISANDER and BINOMINAL. There were plenty of generous anagrams and hidden words in this one. Perhaps it is editorial policy to give us a gentle lead in to the year. Of course, though, Verbascum indulged in the compulsory Listener compiler alcoholic tipple with his ‘Wine from GreeN/Ce King sale ultimately isn’t a hit (7)’ (Giving R = king, salE + ISNT A* = RETSINA), even if he didn’t find that resin-tasting Greek stuff much of a hit. BINOMINAL led us to LINNAEUS and we removed one N(ame) from it producing BINOMIAL. We didn’t instantly link that term with NEWTON (the other Numpty claimed that ‘everybody did binomials, Laplace, Gauss, Euler, Poisson to name but a few’) but Wikipedia did and, naturally, that led us to the apple tree. By this time, we had GOYA in place ‘Artist regularly dipped into goody bag (4)’ (GoOdY bAg) and the PY led us to PYRUS MALUS. We had a full grid and CLUPEA RFA G appearing from our extra letters. It wasn’t difficult to work out that CLUPEA was a generic name for herrings and there was our herring, swimming down our grid. G and g were clearly both Newton’s concerns, so we suspected that we needed a U to turn our herring into a red one. Finding that from 7, 8 or 9 down took us a minute or two. ‘Fine rogue for pinching body part (4)’ (Fine* = NEIF) We had opted for the Shakespearian word NEIF with Dickens’ Oliver Twist in mind. What else would he use his fist for but ‘pinching’? But it was not to be – we needed a more pugnacious interpretation, perhaps a Scottish Robert Burns’ NAVE version of the obscure word to produce that necessary U for our CLUPEA RUFA and ‘punching’ it had to be. So there it was. A couple of hours’ enjoyment that all fitted together thematically giving me an excuse to decorate the grid with at least one red herring (and maybe two!) Many thanks to Verbascum for an entertaining start to the Listener year. 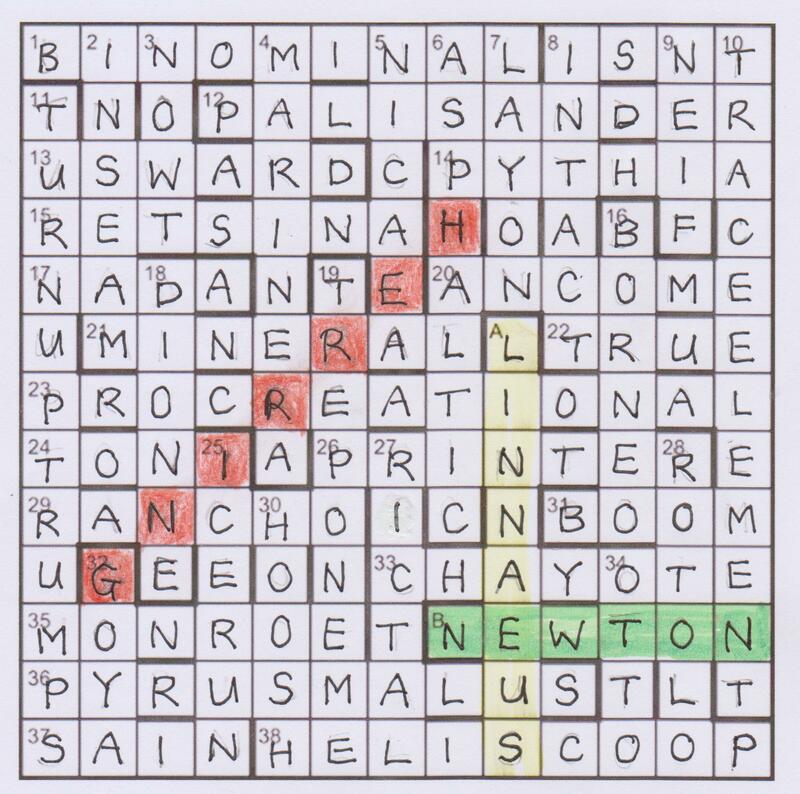 The idea for this puzzle sprang as usual from the fertile brain of Steve Mann, Mango’s founder and leader, and he passed it on to his two Mango colleagues, John Guiver and myself, in November 2006. The three of us soon agreed upon all but one of the main issues. We changed the title from Herrings (don’t ask!) to 27. In keeping with Mango’s preference for more or less thematic clue gimmicks, we decided that letters should disappear from the down clues, and that the message should be “Pot the six colours in sequence”. We settled on the grid configuration and the (somewhat improbable!) paths to be taken by the white and colours (Y, G, B, B, P, B) during the potting process. We flirted with circular cells, to show more clearly how the balls were to rebound off the cushions, but eventually returned to conventional squares, with the balls sticking to the shaded ones. We filled the grid so that it contained no reds or extra colours (but did contain every other letter of the alphabet at least once), and with WHITE LIES at 27 down. The exception was the preamble. We batted ideas back and forth over a period of almost eight months before settling at long last on what we believed to be a challenging but unambiguous form of words. We had spent so much time over the thing (maybe AnswerBank’s Charpy would have had second thoughts before describing our preamble as ‘slovenly’ had he known quite how much trouble we had taken over it) that we were relieved when the Listener men accepted it with only one (very good) major amendment: our idea had been that the first and last ‘white’ cells were to be asterisked, but they proposed instead that the thematic item in each of these cells should be circled, thus indicating without any doubt that the first and last Ws (and by inference the intervening Ws) were not to be deleted. By contrast, writing the clues was a doddle, and took only about seven weeks in all. Each of us drafted seventeen clues, which were then modified in response to criticism until we were all satisfied. We hope that the majority of solvers will have enjoyed this puzzle as much as we enjoyed setting it. The last puzzle of the year, and the Mango triumvirate present us with 27 and a grid that almost looks like an elongated chessboard. 27 appears a lot in the preamble, and I suspected that it may not always stand for the same thing. For example, “The clues (27 without definition)…” seemed highly unlikely to mean the number of clues without a definition (or so I thought), but was more than likely a reference to clue 27. 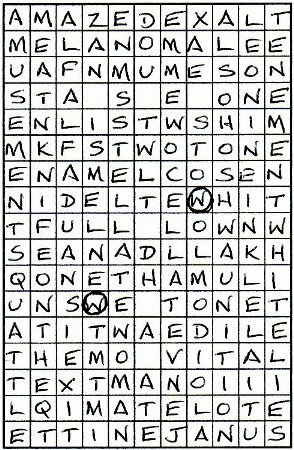 With carte blanche puzzles, I tend to start off in the top left corner and concentrate on that section for a bit, rather than spend a short time on each clue in sequence. Here, down clues had to lose a letter before solving, and, since I was flipping between the two at this stage, I was constantly having to remember whether I had to do anything with the clue. I was pleasantly surprised that I started off quickly with MELANOMA, AMUSEMENT, STAYS, MEAT, ALFALFA and ZANYISM in quick succession. At this point, the dropped letters from the first four down clues read POTT. The next one had ‘thrust’ that could become ‘trust’ and I leapt to the possibility of snooker, with POT THE and a short time later with EMMEW and ALSO solved, it looked like being Pot the six colours. What a great start. The “one thematic item not appearing at all” seemed likely to be R for the red ball, so Yellow, Green, Brown, Blue, Pink and Black presumably would in the form of Y, G, B and P. I also assumed that the White would appear as well. Having started off well, I slowed down a lot. The top and bottom sections of the grid weren’t too long (that’s all relative, of course), but the middle half of the grid proved quite a slow process. Eventually though, after about six hours of solving in three sessions, I had a completed grid. I had, of course, forgotten about 27 not having a definition, and it was some time before “Nuits” with Elsie (9, two words) was revealed as WHITE LIES. So there was another white in addition to six that were elsewhere. The grid was incredible: not only were there no Rs, but the only occurrences of Y, B, G and P were in the positions that the snooker balls would occupy on their spots. As usual with Mango, the clues were flawless, and I can imagine a few eyebrows being raised, or hearts skipping a beat, when the last across clue was solved! And so the endgame. The dropped letters from the down clues read Pot the six colours in sequence. I initially assumed that each white would be used to pot a colour, but there were seven Ws in the grid. As well as there being simple straight pots like the Yellow, it was obviously necessary for some balls to go round the table off various cushions before finding the required pocket. However, I was perplexed by some balls needing to pass through other colours before finding their home, and that didn’t seem right. One thing that must be remembered with every Listener, is that the wording of the preamble is chosen with much care to ensure that when the puzzle is complete, everything … everything… makes sense. I had been correct in my assumption that “27 with no definition” referred to clue 27 which led to WHITE LIES. But “…thereby achieving 27” was a little more sneaky, and referred to the score that is racked up by potting the six colours in turn. Yellow is 2 points, Green 3, Brown 4, Blue 5, Pink 6 and Black 7. That was the easy bit. Next we had “The thematic items stick to the shaded cells throughout (before disappearing in appropriate cases)”. Obviously the colours would disappear, but why use the word “stick” rather that “follow”? It went on “…and at each juncture the 27 in different ones, in the first and last of which the thematic item must be circled”. So, the “white lies in different ones”. Shouldn’t that be “the whites lie in different ones” or “the white lies in a different one”? And how many “junctures” were there — 6 or 7? I was becoming very confused. It would be difficult to describe all the mental torture that I went through, or at what point bottom spin (screwing) and top spin came to mind. It seemed that the Ws were to represent the various resting positions of the cue ball after each pot. For example, the W of TEWHIT would be used to pot the Yellow ball and screw back to the W in TWO TONE; that would then be used to pot the Green and would screw back to the W in EMMEW. Only time will tell whether I was eventually correct in my interpretation of “stick”, but I decided that all the whites would remain in (stick to) their squares in the grid, otherwise it would be difficult to circle the first and last. The colours would also stick to their cells but would disappear as they were potted. In the end, I was happy with my interpretation of the preamble and my completed grid. I was also happy that Mango had lived up to my expectation of a tough, fair and beautifully-crafted puzzle, so many thanks to them for that. Finally, for those of you who didn’t follow snooker back in the 60s and 70s, “Whispering” Ted Lowe (snooker’s own equivalent of John Arlott, Dan Maskell and Peter O’Sullivan) once uttered the immortal words: “For those of you watching in black and white, the pink ball is just behind the green”! Surely not a carte blanche for our last of the year? Well, I’ve said before that I rather like cartes blanches, especially if there are those reassuring words in the preamble, ‘The clues are listed in normal order and the entries exhibit 180-degree symmetry’. If it’s a Mango production, we can count on impeccable cluing too, so there is no real cause for Numpty concern. That 27 appears four times in the preamble, once telling us that it has no definition, once that it can be ‘achieved’, once that the 27, ‘at each juncture’…is … ‘in different cells’ and finally that we need not even enter a clue number ‘the thematic 27’. In retrospect, we realize that this told us a great deal but we didn’t immediately link 27 to the number of points you earn if you pot all the six coloured balls in snooker. 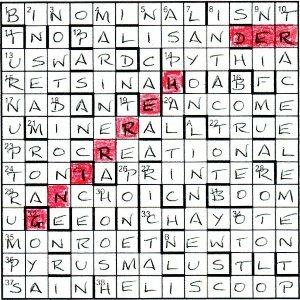 Surprisingly, though, with the extra letters in the down clues emerging so seamlessly as we worked downwards in our grid, POT THE SIX CO… was soon apparent and we had our first inkling of the theme. For a while, we almost solved the clues in order as AMAZE, EXALT, MELANOMA, MU-MESON and STAYS appeared in that order, of course establishing the pattern of bars at the bottom of the grid too (for, of course, we were inserting them to make our task easier). I did like ‘Oedipal pair repressing a bit of eroticism? A very tiny bit (7)’ with MUM and SON embracing an E(roticism). Of course Mango did not let us down on the alcohol front either as there was ‘Time to crack a bottle full of spirit (5)’ VIAL round T. What lovely clues both were. I liked ‘Provincial set on catching a chill? Like ****! (8) too. (STELLATE + A[C]HILL = A TELL* inside SET*)Rasputin have a similar use of * in their current IQ and, intriguingly, the use of six colours too, with their A*te – ASTARTE – producing the star on the top of the Christmas tree and the colours for the baubles. I like to have a graphic element introduced into a grid too. I think we were lucky in solving AMUSEMENT and having the anagram finder suggest WHITE LIES to us (NU[I]TS WITH ELSIE) very early in our solve, so that we had a full grid after a couple of hours of very pleasurable solving. We knew, too, that we had to POT THE SIX COLOURS IN SEQUENCE. I haven’t played or watched snooker since our nightly sorties to the A BOMB in the Australian ski resort of Mount Buller when I was working there over forty years ago but the other Numpty obligingly listed the colours in order: Yellow, Green, Brown, Blue, Pink and Black and all that remained was to work out how to pot them. At first we hunted for colours but, of course, all we found were initial letters and seven examples of W for white. Now, logically, in order to score our 27, we have to pot those in the correct order, but the white ball should stay on the table. This was a bit of a head-scratcher and we returned to the preamble, knowing that that gang at Mango were going to be very careful about spelling out how we had to proceed. So we read step by step. The thematic items (our six coloured balls and the white that is being cued into each of them) stick to the defined paths, so clearly only five pockets are being used. ‘In appropriate cases’ these thematic balls have to disappear. Well, even I remember that I didn’t want to pot white, so, clearly, the appropriate ‘cases’ are the six colours. Presumably, then, my six white cuing positions and the white itself will still be on the table at the end of our game. We are told that, ‘at each juncture the 27 (WHITE LIES) in different ones (CELLS) and we are instructed to circle the thematic item in the first and last of these – presumably the ball that sends the first yellow into its pocket, and the white ball that is left on the table at the end. That took me a few attempts of putative playing before I managed to sink them in sequence and always have a white ball conveniently placed for the next shot. It seemed like a rather improbable game (especially with me playing it) However, we managed to produce a convincing solution. So there we are! Thank you Mango! That was quite something!